At all the hotels at Couples Resorts we’re used to seeing our fair share of turtles, such as the new hatchlings at our Barbados resort last week, but there’s one turtle that will always remain in our hearts – Charlie, the resident sea turtle at Couples Sans Souci. If you’ve visited the Sans Souci resort you may have been puzzled over the name for the spa, Charlie. The spa took its name from the Charlie, a friendly resident sea turtle who lived beyond the age of 100 years old. Charlie lived in the mineral spring grotto that bubbles up from beneath the resort, spouting rejuvenating waters. The tempestuous tale of how Charlie came to live in the grotto has fascinated everyone. On Friday 17th August 1951 Jamaica was hit by the powerful Hurricane Charlie. Winds swept over the island at over 100 miles per hour leaving 154 people dead and 25,000 people homeless. 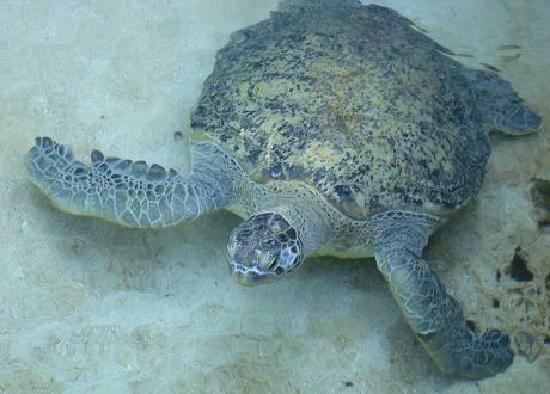 It also washed up one injured green sea turtle on the shores of what was then the Ocho Rios Resort. This turtle found sanctuary in the property’s grotto settling in nicely and calling the place home. The staff members working at the resort at the time believe that the turtle was swimming to the shore to lay eggs and got caught up in the stormy sea caused by the hurricane. She was named Charlie, after the hurricane, and she became a local, and later international, celebrity and jewel of the later built Couples Sans Souci. Sea turtles generally live to an average of just over 100 years old. They are slow in developing, reaching sexual maturity in 20-30 years. If Charlie was over 30 years when she came on land 58 years ago, that would place her to be at least 88 years old minimum. No one knows how many trips she made before. Educational training was provided to the team members at the resort about the importance of preserving turtles, so Charlie was well taken care of. A regular feeding schedule put in place by the management of the resort to ensure that her diet was cared for. Visitors flocked to the grotto to see her and it wasn’t too long before meal times for Charlie became a must see event. Couples Sans Souci were proud to play a part in preserving the legacy of endangered sea turtles. Charlie lived a very happy life in her own cave and it became her new home for the next 58 years. In September 2009, Charlie began to display signs of ill health. She wasn’t eating or swimming as much. Concerned management contacted two veterinarians who carried out tests and administered treatments. Days later she suddenyl seemed more energetic than she had been in the past few days and went for a swim in her grotto. It was, however, the last swim she would ever take. On 14th September 2009in the morning the duty manager visited Charlie but found her to be unresponsive and was confirmed as dead on arrival by the veterinarian. Though Charlie is no longer around, her legacy lives on at the Sans Souci resort. The spa is still called Charlie’s Spa and all sites at Couples Resorts are devoted to protecting any sea turtles that climb ashore to lay their eggs and will continue to do so in the future.